Today I had to battle my demons, and stop obsessing about some terrible thing that happened recently, so I decided to try anything I could, and went for a long run. It did help somehow. After a few hours of running in circles, I went home and had no idea what I would make for lunch. I had no appetite and and no inspiration either. I found among my million items in my pantry those edamame fettucine I bought along with the black bean spaghetti a while ago. 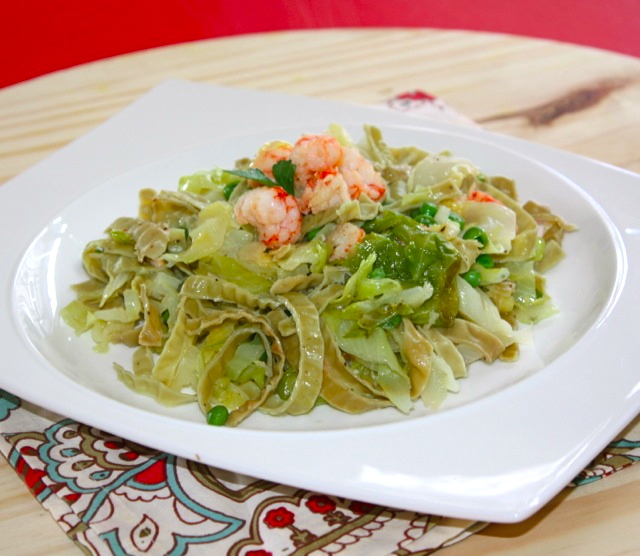 So basically, edamame and mung bean fettucine are simply a type of pasta made with edamame and mung bean flour, that’s why they have this beautiful light green color. In the picture they could be blending with the cabbage color, but if you look closely, you can distinguish the fettucine. This type of pasta is filled with fibers and proteins, so you will not feel bloated or stuffed as you would when eating regular white flour pasta. They are easily digestible, nutritious and very delicious. They remain a bit chewy and al dente, and personally I love chewy textures. 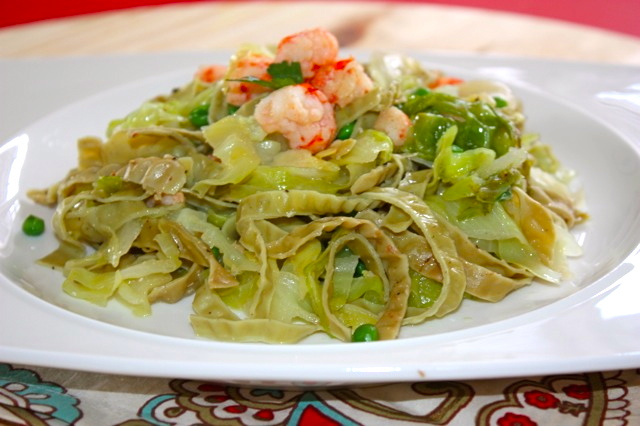 The combination of the sweetness of the cabbage and peas, complement the nuttiness of the noodles, so we have a very balance dish as far as textures and flavors. I ate two whole plates so this portion is enough for three people, or two if one of them is very hungry. Heat olive oil in a pan, add onion and let soften about 5 minutes at medium temperature. Add cabbage and mirin. Cook and cover until cabbage softens but still a bit firm and mirin evaporates. Add peas, shrimps and garlic. Cook until peas and shrimps are cooked. Adjust with salt and pepper. In the meantime, cook fettucine in hot salted boiling water until al dente, about 5 minutes. Drain and serve with cabbage, peas, shrimps mixture. Drizzle some extra unrefined extra virgin oil on top and serve hot. This entry was posted by silvia on April 22, 2016 at 12:01 am, and is filed under Express - Less than 30 minutes, Fish/Seafood, Misc recipes, Pasta. Follow any responses to this post through RSS 2.0.You can leave a response or trackback from your own site.